Like all other arts and crafts forms, the aesthetic value of an individual work is determined by the viewer. 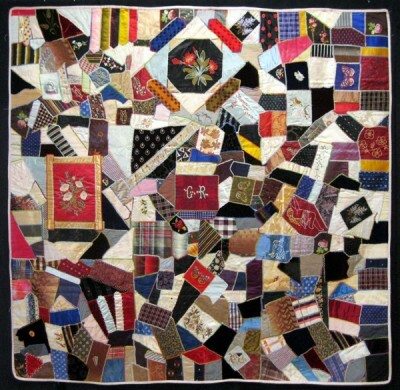 Beginning in the Victorian era with crazy quilts, art quilts have been appreciated by many. 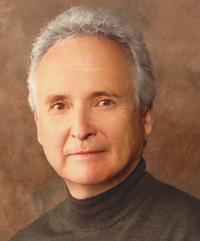 Gerald Roy continues his thoughts on the progression of art quilts in history in this article. The Victorian era (1837–1901) (see, Art Quilt Phenomenon article) would soon be followed by 36 of the most tumultuous years in American history. World War I began in 1914 and Prohibition in 1919. Wall Street crashed in 1929 and was followed by The Great Depression and The Dust Bowl of the 1930s. Pearl Harbor was attacked in 1941 and drew the United States into World War II through 1945, when it dropped of two atomic bombs. Five years of peace ended with the Korean War in 1950. When men went to war, women took on their jobs as well as their own. Women who left their homes for factories and cities to pursue professions usually abandoned their previous way of life, even if their husbands did return from war. Being paid and having a career leaves little chance that women will return to the home or the farm. Time-consuming activities are abandoned in favor of labor-saving devices and products that are mass produced in factories rather than one-of-a-kind ones made at home. Quilting was just one of the many activities that suffered. Yet, quilt making was passed onto the succeeding generations where it was still important to the economy of a region or where it was deeply embedded in the heritage and tradition of a family or community. This was how many rural areas were especially influential in enabling many of our nation’s early crafts to survive times until there was renewed interest in them. Pride and appreciation in traditional American art, crafts, architecture and just about all things American was later reinforced by the positive attitudes and activities established during and between the World Wars when private, public, and governmental agencies got people back to work. E.J. 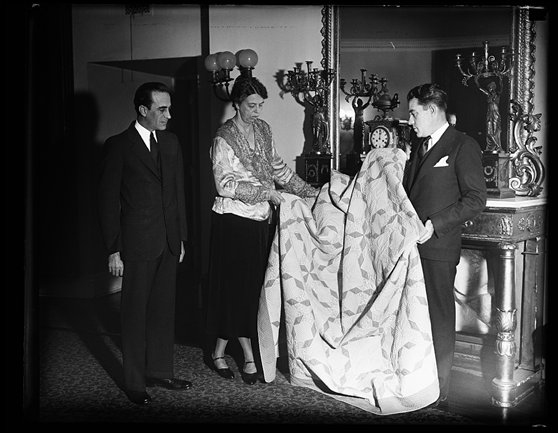 Condon presents the winning quilt to Mrs. Eleanor Roosevelt at the World’s Fair in Chicago in 1933. L.T. Conway views the ceremony. Both men were connected with Sears, Roebuck & Co.. 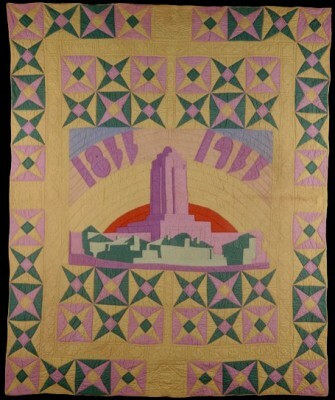 The prize winning quilt was made by Margaret Rogers Caden of Lexington, KY. – photo from the Library of Congress. We saw this occur in 1939 when the Work Progress Administration (WPA) employed 8.5 million workers, not only to construct buildings, roads, bridges, and tunnels, but also to create music, paintings, and literary works for public purposes. No wonder the WPA was responsible for the founding of The National Foundation for the Arts and the National Endowment for the Humanities. The popularity of quilt making was accelerated when government, private, and corporate interests recognized the power of quilts to attract and engage huge audiences. With all the financial problems facing the country, the revival of quilt making and many other crafts was seen as a way of stimulating an economy that has suffered during the wars, and the depression. 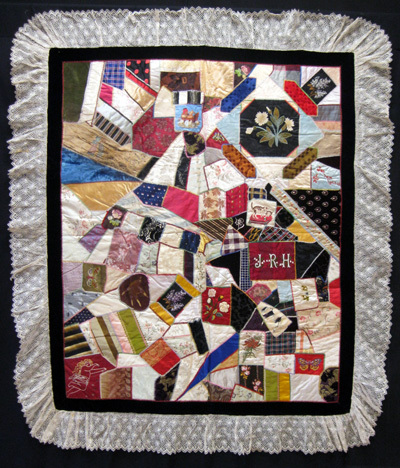 By the late nineteenth century, country fairs across the nation included quilt contests and exhibits. A National Quilting Bee Contest was launched in 1911. Little is known about the entries or the results. The 1920s and 1930s saw the rise of professionally designed patterns and quilt kits advertised and distributed nationally. Companies such as Stearns & Foster Co., maker of Mountain Mist batting, suggested quilt shows and competitions to promote and encourage quiltmaking. In 1932, The Eastern States Exposition at Storrowton, Massachusetts held the first national quilt contest. 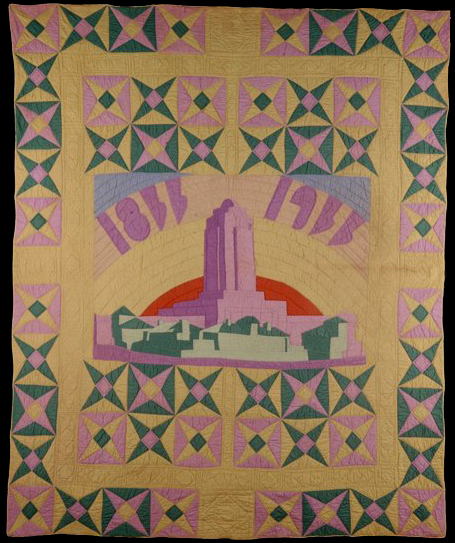 In 1933, the Sears, Roebuck and Co. organized a national quilt contest in conjunction with Chicago’s 1933 Century of Progress Exposition. 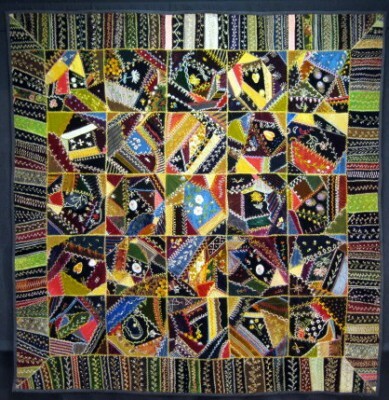 Over 25,000 quilts were judged at local and regional levels. At the final national round held at the Sears Pavilion, of 30 regional winners, a traditional quilt entered by Margaret Caden of Kentucky won the $1000 grand prize as well as the honor of the quilt being given to Eleanor Roosevelt. Then in 1939 and 1940, over $3,000 in prize money was awarded at contests organized in conjunction with the New York World’s Fair sponsored by department stores and Good Housekeeping Magazine. Competition had always been a part of the history of quilt making; however, prize money of this proportion brought a whole new dimension to the effort. These events changed the complexion of quilt making forever. 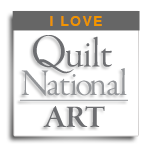 Professional designers and artists from other disciplines adopted quilt making as their media of expression. Quilt making became a full-time career for many with an entrepreneurial spirit. Many of the quilts from this early contest era maintained their sizes so their intended use was still assumed to be as practical bedcovers. However, this idea soon faded when their intent was clearly recognized and they were intended to be seen as art. “Art quilts” and the issues they raise have been around a lot longer than most people think. JRH 1886 – 52” x 60” silk, satin, brocades and cotton lace. It’s important to note that they technically aren’t quilts because most aren’t quilted. In addition, they did not evolve from traditional quilts. In fact, very few skilled traditional quilt makers ever made them. Having perfected their needlework skills and ability to accurately piece and appliqué, they did not find the style, materials, techniques, and embellishments of Crazy quilts appealing. Instead, most Crazy quilts were made by women who possessed minimal quilt making skills but had the time and the money to focus on beautifying and decorating their homes in the latest fashion. (Quite often this was evidenced through excess and often vulgar displays of wealth and poor taste.) Whereas bedcovers tend to get worn out, Crazy quilts more often survived the test of time. This factor coupled with their serving only an aesthetic purpose increased their likelihood of being regarded as objects of art. The controversy between art and utility has been ongoing. Because paintings serve no practical purpose and often are associated with art museums, there is a misconception that all paintings achieve art status. This in turn has led to another misconception – an object made for a practical and useful purpose is not art. Of course this premise is absurd because objects, regardless of purpose, are displayed in major art museums worldwide. Yet, even most quilts represented in museums were relegated to craft because of their association with their utilitarian purpose as bedcovers. Therefore, they generally were selected for their workmanship or historical significance and not because they were valued as works of art. Whenever I see this occur I suggest, “Step away from the quilt and see that there’s far more to the quilt than only its technique.” This rarely occurs in art world, where most works of art undergo “The Twenty Paces Test.” Only after evaluating a work from this distance should the viewer go closer to examine technique. That’s why even utility quilts with less than masterpiece techniques can rise to “art” status. G.R. 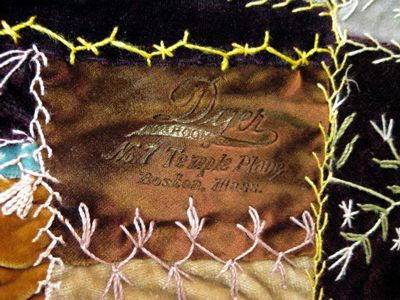 1886 – 56” x 58” silk, satin, velvets, brocades.